Sad to hear. Same thing happened to my wife's little kitty cat a couple of years ago. Afterwards, I stained a small 4"X4" piece of plaque wood from Hobby Lobby, put a picture of her kitty on it and coated with poly (Envirotex Lite that I use on my plugs and poppers) and hung it on our screened in back porch as a little monument. That was the same place we had to put her down-- lady Vet, who was wonderful, made a house call for us which was much better than the trauma of taking a pet in yourself--especially for a cat who did not like going anywhere in a car. The wife likes to sit out there and drink her coffee in the morning. I think that little memorial brings her some peace and fond memories. But it took awhile before she could look at it without crying. Randy Hamilton's Copperhead is a very popular and effective fly but best suited for more stained water. A mix of shrimp / crab patterns like Quans, Merkins or Puglisi brush crabs, some weighted, some not for fishing tailers. Baitfish patterns like Puglisi's, Bendbacks like the Prince of Tides, Clouser minnows or Half and Halfs. A few Gurglers or similar topwater flies for when they're chasing shrimp. Cover the water column from top to bottom. Weed guards strongly advised. Some bright and flashy or black/dark purple or chartreuse for muddy water. Some more natural colors for clear shallow water. They like bunny flies too. Good news is that redfish aren't usually too selective, but they will spook in shallower water if you throw something with too much presence or if it's too bright or too heavily weighted in clear, shallow water. Some of your larger Belize flats flies will do just fine. Rubber legs are a plus. You don't need a great big fly box. Just a few proven patterns in various colors and sizes to cover the water column. Good luck. 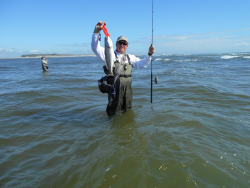 Down south of ya'all they are very effective for slot redfish in the surf. Usually my first choice as a searching lure when the water's dirty and the water is all churned up. Sometimes I'll replace the rear treble with a Colorado blade for some extra flash. Great winter lure for our river stripers too. They school up in deeper holes. Throw up current and count it down. Slow retrieve with short twitches. Deadly. You're reading my mail. My new years resolution for 2019 was to learn two handed casting / fishing. So far I've made about as much progress on that one as I have on trimming a couple of inches off my gut. Still 8 months left. Cheers. How about dudes flying in their PJs? Kind of cute for 19 year old college girls going home to see mom and dad. Not for some 30 or 40 something lard bucket scraggly face couch tater with a man bun and four days of accumulated BO. Set the example in your own behavior and avoid moralistic or confrontational behavior toward people who are abiding by the law. Most Americans recoil at unsolicited judgments and course corrections from strangers. To me, that is almost as obnoxious as the self aggrandizing hero shots on social media that are often staged. I've evolved over many decades on the water, and I now do my best to be ethical and preserve the resource. My conscience reminds me that I didn't always adhere to such a high standard when I was younger. Let's not turn the beach into a college campus with shaming and virtue signaling. Super cool! That looks like spent brass at the bottom to me. If so, I guess you just pop out the primer to through wire and epoxy in after you paint. What a great idea. For fishing bait, live or dead, a conventional reel with a clicker is better than a spinner IMO, even a Baitrunner style. But that boils down to personal preference. Level wind is another feature you might consider, and there are many choices from relatively inexpensive to high end like a Tranx or Lexa. To me, a lever drag reel is the best way to go whether trolling plugs or slow trolling or drifting / chunking live or dead baits. The ability to fine tune your drag to conditions--current, wind, trolling speed, weight and drag is a big advantage over a star drag, but a star drag is definitely simpler and easier to maintain. Penn Squall is a relatively inexpensive LD reel that comes with or without level wind, and it's a very solid, dependable. Penn Fathom is a step up. Shimano TLD is another great choice. I'd also look very hard at the Siegler SG reel. Compact, very strong reel at a reasonable price. Entirely suitable to bouncing bucktails for fluke or medium to light trolling duty or chunking. I just wish their clicker was louder. Avets are great reels too. Rods? Just too many to mention and most at very affordable prices for what you want to do. I'd go to your local tackle shop and ask them for a recommendation. To me, JC nails add a touch of magic to streamers that just can't be replicated with anything else. Unless you are tying presentation flies, the cheaper capes are fine for fishing. Just add dubbing wax. I still wish that I knew the rest of the story on why quality flatwing saddles went the way of the dinosaurs. Thanks for posting those pics Sudsy. I built a dryer with a rotisserie motor a long time ago, but it's a POC compared to yours. I'll be heading to Lowe's soon and will copy your ideas liberally.